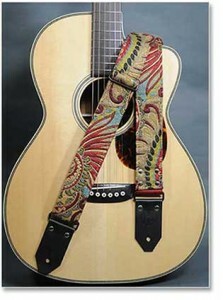 Hang Over guitar straps are individually sewn in Tennessee using tapestry-like premium upholstery fabric and backed with thick woven nylon. They’re comfortable, moderately thick, and include double-thickness veg-tan leather ends and hand set double-cap rivets. Strap patterns vary depending on how the fabric is cut, so no two straps are exactly the same. Hardware colors, leather ends and backing material are chosen to compliment the fabric. Approximately 60 inches long by 2 inches wide. Shipping within the U.S. is $6.95 for 1-2 straps via USPS Priority Mail.